According to a story published on Entrepreneur.com, for every 30 copies printed in an office, 39% of them are just thrown away. On top of that, it costs about $25,000 to fill a four-drawer cabinet that holds 15-20,000 files, and $2,000 per year to maintain it. To save on paper, labor, and space costs, many companies are making the move to digital and scanning large documents and drawings. With our extensive experience with large scale paper conversion and our flat rate scanning prices, printing and converting your large documents is both affordable and accurate. When your documents and drawings are received at our office, they are scanned at a default 300 DPI and uploaded to a secure server. Depending on your needs, you can choose from PDF, TIFF, or JPG formats. We also have options if you prefer your documents black and white or in color. Once the documents have been scanned, you’ll receive a user name and password that will give you access to download your image from the server any time you need. The original printed documents in the quantity you specify are shipped back to your facility at no extra charge. 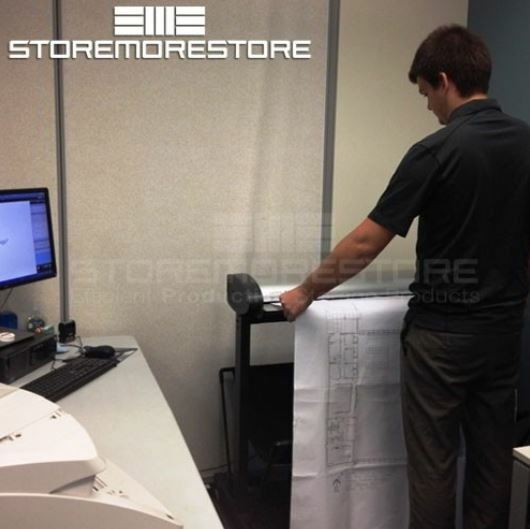 We offer different options for our large document and drawing scanning services. And if you don’t see an option that works for your company or you have more questions, please don’t hesitate to give us a call at 1-855-786-7667. All over the country businesses are downsizing their physical office spaces. Just four years ago each employee was allocated 225 sq. ft. of space, now they’re down to 150sq. ft. There are a multitude of reasons for these changes: rising costs of real-estate; increases in workers telecommuting or hotelling; and businesses switches to open office designs. But one thing hasn’t changed – businesses still have stuff to store. Trying to maintain your storage capacity in less physical space is hard when you’re still relying on outdated storage systems like lateral file cabinets. 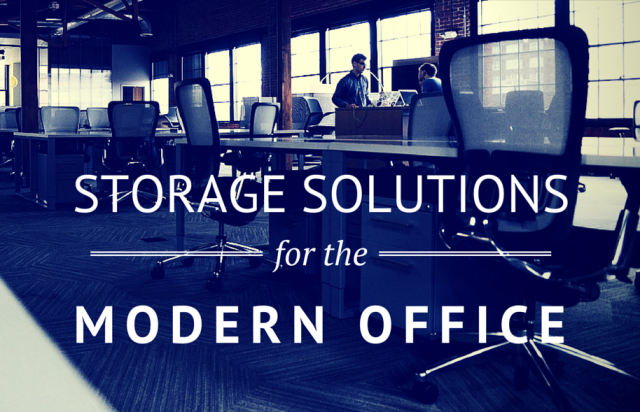 To adapt to the modern office space, you’ll need to change the way you think about storage, and we can help. Here are 4 different storage solutions for stuff at your office that will maintain or even increase your storage capacity in a smaller space. According to a story published on Entrepreneur.com, for every 30 copies printed in an office, 39% of them are just thrown away. On top of that, it costs about $25,000 to fill a four-drawer cabinet that holds 15-20,000 files, and $2,000 per year to maintain it. To save on paper, labor, and space costs, many companies are moving (at least partially) to digital documents. And if you’re ready to take that step, we can help. Read more about our document scanning services in a previous blog here. Many times it’s not the storage system itself that takes up all your space, it’s actually the space you need to access the system. Like the space for the drawer to extend in a lateral file cabinet, or the aisles between each row of shelving. Sliding storage shelving gets rid of this unnecessary access space, and gives you back the floor space. 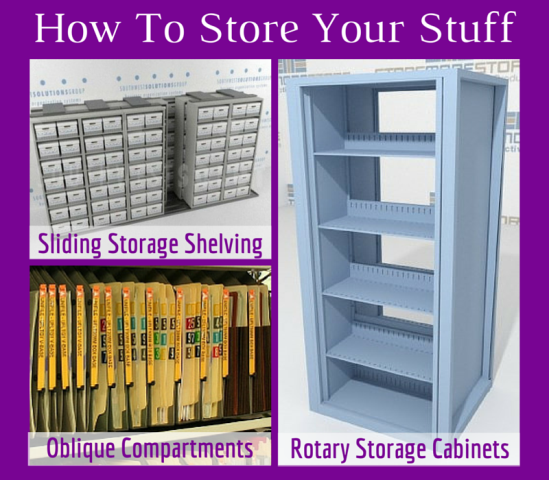 Find out how sliding storage shelving works to get rid of clutter and save space here. Directly transferring office files into a perfectly organized open shelving system means you could fit three times the number of files into half the floor space required with lateral or vertical drawer file cabinets. But how can you transfer top tab files to open shelving without converting to side tab folders? You do it with Oblique hanging compartments. The Oblique hanging compartments enable you to move to a more efficient style of storage shelving, without converting your filing system. Take a look at all the available Oblique hanging compartments here. Rotary storage cabinets work for everything in your office including files, office supplies, boxes, binders, books computer media, and more. And since the cabinets have two sides and spin 360 degrees, they provide way more storage capacity in much less space. In fact, you can fit the stuff from 3 lateral cabinets in just one rotary storage cabinet. Find out what else you gain with rotary storage cabinets here. These are just a few storage solutions for increasing capacity in less office space. To see more options click here. Or you can give us a call at 1-855-786-7667, and we can design a personalized storage system just for you. Types of Documents We Can Scan? What Size Documents We Can Scan? We can scan a wide range of documents in many different sizes. 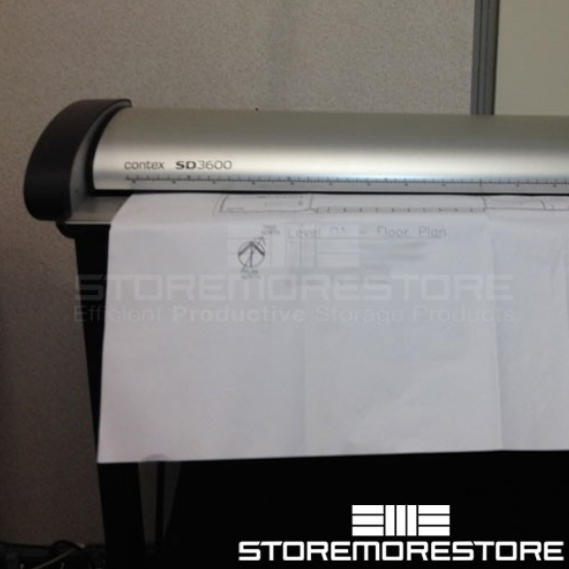 The largest sized document we can scan is 36″ x 72″. And we can handle documents up to 1/8″ thick. What Format are the Scanned Documents? Our team will scan your documents at 300dpi and then upload them to a secure server as a PDF, TIFF, or JPG for you to download. Depending on your needs, you can choose from any of these three popular formats. And we have options if you prefer your documents black and white or in color. The customer is responsible for shipping documents to our facility; however, we will pay for return shipping (standard ground shipping by USPS, UPS, or FEDEX in the United States only). What is NOT Included in Our Services? You can order our document scanning services online directly from our website. And if you have any questions, please don’t hesitate to call us at 1-855-786-7667.